As part of my ongoing mentorship of tomorrow’s broadcasters, I introduced a young lady to a newsgathering tradition as old as the microphone flag itself: the Man on the Street interview. Actually, I just needed some bystander sound for a piece on credit scores I’m putting together, so I grabbed Intern Liz and together we rushed to the nearest Wal-Mart. There we loitered in the far end of the parking lot, away from any pesky manager types who might ‘go corporate’ and force me to desist with my little expedition. So Liz and I paced under a light pole with a security camera on top, trying to look as casual as only a lingering news crew can. To Wally World’s credit, we remained unscathed during our entire ten minute visit - though one bag boy glared at us mightily he rounded up abandoned shopping courts. I was pretty sure I could take him, should the parking lot suddenly go apocalyptic but since I’m a uniter and not a divider I chose not to return his accusing gaze. Liz didn’t seem to relish the idea of begging for soundbites, but I felt better - especially when a rumpled yet avuncular gentleman in an old school pimp hat strutted up and asked what we were doing. ‘Yahtzee!’ I thought as I answered with something about a friendly little poll. Much to my surprise, a broad and broken smile spread across Uncle Pimpy’s face and he let loose with a detailed explanation of neglected credit scores and their detrimental effect on acquiring reasonable interest rates. “You sure talk purty,” I feebly offered as the man readjusted his brim and made his way to the awaiting oasis of a couple dozen discount bins. Reinvigorated in his wake, I turned to an approaching column of housewives and reeled them in with ease. Minutes later I had more sentences committed to disc than I could possibly use and I told Liz as much. I’m not sure she was all that impressed as I whisked her away to Unit Four, but I was just happy to be done - especially since a certain surly bag-boy was pointing a most rotund store manager my way. It’s the middle of Sweeps and I’m on call, so of course some jackass tried to torch a school. 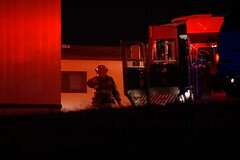 Actually, only a mobile classroom burned, but it was hot enought to make my bedside phone explode ten miles away. I let it ring at first, but an illegal elbow from my blushing bride rousted me from my torpor and I fumbled around for the screaming thing. Upon finding it, I brought it to my ear and blinked in the darkness as a tiny woman ordered me to war. 'School trailer on fire, call me when you're up and on the road. ' Three minutes later I called Felicia back. The executive producer of the morning news told me what she'd heard on the scanners, but she didn't have to explain the implications. A little more tha a year ago, the entire region watched a public high school burn to the ground on live TV. The afternoon Eastern Guilford ceased to be, I ate ice cream from the safety of my desk and watched the smoke plume branded in three different logos. I knew then I was cheating the News Gods by simply not being on scene. Today I repaid that debt and as always, the Gods demanded exact change. 5:35 AM -- 6:25 PM The flames were out by the time that I arrived. The firefighters remained however, tired figures in turnout gear rolled up hoses and broke down air-packs as the growl of the roar of their trucks drowned out all other sound. None seemed to notice me as I parked behind a idling tanker and started breaking out my own gear. There wasn’t much to shoot. No flames, no smoke, no water, no ash. The gutted classroom lay just out of sight, hidden by another row of trailers and cordoned off with a string of yellow tape. It left me little else to aim my lens at than swirling red lights and building silhouettes, so I did just that before calling Felicia. With the morning anchor team chuckling live(!) on the soft-set, she needed any detail I could glean from the scene to feed into their earpiece. I obliged, telling her what little I could before hanging up and flagging down a mustachioed fire chief. Confirming only what I already knew, he told me he was waiting on the school’s principal to arrive. On cue a woman strode out of from the shadow’s with all the purpose of well, a school principal. Ignoring me, she asked the chief where her car line might be allowed to form when it began arriving in half an hour. I soaked up every syllable of the exchange before stepping away and repeating it into my cell phone. Ten minutes later I was back in Unit 4, driving my video to the station and figuring I was done with this garden variety fire. 9:25AM -- 12:15 PM I was wrong, of course. 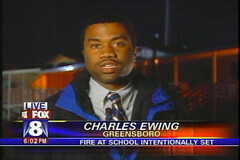 The early morning school fire was all the suits back at the station could talk about. No sooner did I saunter in the conference room, than I was assigned a live truck, a reporter and a new deadline. Charles Ewing rolled his eyes as he gathered his stuff. Together we left the newsroom as the management team mentally high-fived each other. Fifteen minutes later, a brightly decorated live truck pulled up outside the inner city school. Carefully avoiding a broken 40 ounce bottle, I parked away from power-lines, but as near the trailers as possible. No other TV trucks were present the time, but I knew that would change by the time the director of the noon newscast director punched up what would soon be my shot. First though, we needed sound, so Charles and I abandoned the sanctuary of Live Five for littered slope of one ghetto playground. There we found the characters needed for our story arc: the worried principal, the excited students- even a matter of fact fire captain who greatly elongated our day with a single word: Incendiary. That’s fireman-speak for ‘This mobile classroom didn’t burn down by itself.’ Charles and I exchanged annoyed glances at the mention of the word, knowing its very usage indicated a long afternoon indeed. First there was a noon live shot to contend with, so I recorded a few more scenes, raised the mast, established the signal, edited the video, fed the footage, set up the camera, tested the microphone and cued Charles just in tiem for a high noon lead story. Nodding knowingly, he cranked up the action by announcing the fire was intentionally set. As that late breaking development ricocheted across the region, we broke down the truck and went for Mexican food. 2:45 PM -- 4:40 PM As Charles made small talk with the lady in the battered Saturn, I ambled up with a TV camera on my shoulder. Before the waiting mother could respond to Charles off the cuff query, I was centered, focused and rolling. Technically she never consented to an interview, but with the one eyed monster on my shoulder didn’t tip her off, the fancy microphone in Charles’ hand surely did. Either way, we moved down the row of cars and rinsed lathered and repeated until we had the sound we needed and my knees ached from the kind of awkward squatting required for such impromptu interviews. Back in the live truck I put my feet up and cradled the fancycam while Charles reviewed every frame of the footage I’d committed to disc since shortly before dawn. Soon the sound of my coverage faded, replaced by a muttered phrases and a scribbling pen. When Charles was ready I tossed him a microphone and he spoke his script aloud while I watched the audio needles dance. When we had a take he liked, we switched seats and I broke open the laptop in back. Opening a timeline and ingesting shots, I dragged and dropped until a coherent narrative began to form. Fleshing out the sound with corresponding pictures, I sliced the edges off wide shots, butterfly-cut the nighttime footage with the dayside tape and softened it with a single dissolve. Lost in my work, I savored the fact that five o clock was near and so too was one very long, inert shift. That’s when my cell phone rang. 4:40 PM -- 6:10 PM “Guess who wants us live at Six?” Charles asked no one in particular. I cursed my answer, though I really wasn’t surprised. A suspicious school fire, no matter how inconsequential, deserved mention in the Six o clock - if not a full-blown dog-lick live shot. Why’s a dog lick himself? The same reason a TV station goes live at the drop of a hat: they bought a lot of broadcast trucks. While it ain’t my idea of quality programming, lots of people above my pay grade think they’re swell. So it was with only limited ire that I embraced this latest gig. Hey, who wouldn’t want to watch the sun set over Crackpipe and Vine - especially when you saw the very same orb first light this corner of the hood a scant twelve hours earlier? Digging through my light kit, I found a blue gel and a few clothes pins. Oh well, at least I’ll have time to stare at those petrified cigarette butts some more, I thought. After the five o clock live I did just that, until all the light in the sky faded and I was forced to abandon my gels for a trust umbrella. When the bulb on my backlight burst a minute before air, I scrambled to the live truck and found a handheld spotlight. I barely had time to shine it on the back of Charles’ head before our main anchor introduced him. As Charles launched into his now familiar spiel, I watched his image flicker through the live trucks windshield and wondered if Sally Joe Housecoat ever considered the amount of effort that goes into even the most fleeting of updates. Guess she shouldn’t have to. When I first started hanging out in newsrooms, I’d pop up like a prairie dog every damn time the scanners burped. Today when spot news bleeds from that row of police radios, I more resemble an infected ferret, as I l fast-crawl out of the room on my toes and fingertips. Whenever I’m shooting video in a elementary or middle school, I look for the most unremarkable looking kid in the classroom and make sure he or she gets on television that night. Those dorks in high school are on their own. You do not have to be looking in the viewfinder to be recording. One of the first things you figure out how to do when left alone with a camera is to deny the damn thing is even on. So, if you’re picking your nose at a city council meeting across from what appears to be an inattentive TV camera - well, go ahead and set your DVR. I use to s-t-r-e-s-s en route to stories: mentally reviewing equipment checklists, worrying about how I might capture all the pictures, sound and details once I got there and generally questioning my self-worth. Now, I can race to an orphanage fire and daydream about old Seinfeld episodes all the way. Is that wrong? Yes, we can hear you - we’re just ignoring you. You’d feign deafness too, if two out of five otherwise sane citizens soiled themselves in your presence Personally, I physically cannot even hear the words “Hi Mom!”, “Put me on TEE-VEE!”, or “Hey, where’s that purty weather lady?” Selective deafness - it isn’t just for teenagers anymore! Sure, we wanna do quality work. But if that means escorting some obnoxious dolt through his day, count me out. In other words, if you’re a really talented reporter but your braying laugh, delusions of superiority or pre-interview speech make you a drag to be around, I’d just as soon make a star of that intern with the unibrow. Underestimate me all you want, I can spot a talker from across a shopping mall food court, make you look fat with the twist of a light-stand, put a top-heavy live truck into a controlled hydroplane and interview an Economics professor without ever letting on I don’t know what the hell I’m talking about. Just don’t ask me to learn the phone system. A man's got to know his limitations.